The uncertainty that researchers face in specifying their estimation model threatens the validity of their inferences. In regression analyses of observational data, the 'true model' remains unknown, and researchers face a choice between plausible alternative specifications. Robustness testing allows researchers to explore the stability of their main estimates to plausible variations in model specifications. 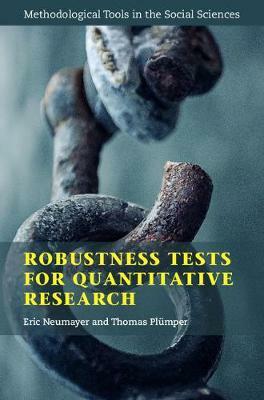 This highly accessible book presents the logic of robustness testing, provides an operational definition of robustness that can be applied in all quantitative research, and introduces readers to diverse types of robustness tests. Focusing on each dimension of model uncertainty in separate chapters, the authors provide a systematic overview of existing tests and develop many new ones. Whether it be uncertainty about the population or sample, measurement, the set of explanatory variables and their functional form, causal or temporal heterogeneity, or effect dynamics or spatial dependence, this book provides guidance and offers tests that researchers from across the social sciences can employ in their own research.